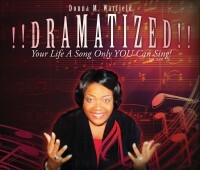 Home Page About/ D R A M A | Dramatized! Your Life a Song only YOU can Sing! About Dramatized! My life has been adventuresome, fulfilling and exhilarating; and for that I am grateful. Along the way I have had my share of pain, defeats and disappointments. This project is a culmination of both music and words of expression. It will propel you to look at life from a different perspective. My life has truly been a song only I can sing. Enjoy!! !